It was a wagon massacre, not tragedy! As many as 70 anti-British agitators, mostly Muslims, locked up in a goods train and sent to Central Prison at Podannor near Coimbatore on November 19, 1921, were found dead in the wagon the next day. This is etched in Kerala anti-colonial struggle as the Wagon Tragedy. No one consciously creates a tragedy. However, whenever one does such a thing it should no more be called a tragedy. The British who ruled the country, however, had been clever. By using the suffix ‘tragedy’ they lessened the intensity of the inhuman crimes they committed. 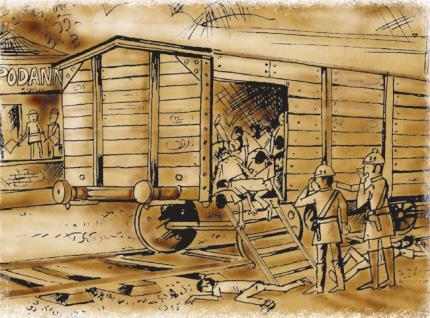 The Jallianwala Bagh shoot-out was not a tragedy; nor the stuffing of 101 persons inside a railway goods wagon. The Wagon Tragedy of 1921, in fact, should’ve been known as Wagon Massacre. Although 90 years have passed, the Wagon Massacre still remains as an event largely ignored by the official discourses of anti-colonial struggle at the regional and national levels. Even, survivors of the victims of the tragedy have no concrete memory of an event which represented one of the bloodiest chapters in the oppressive British regime in Malabar. The run up to the inhuman incident has to be traced through the narrative of Mappilla Rebellion which gripped Eranad and Valluvanad taluks of the then Madras Presidency under the British rule. The nature and character of the rebellion is a controversial issue in the historiography of Malabar in particular and Kerala in general. Wagon Tragedy is one of those incidents, which deserves a treatment such as Event, Metaphor and Memory; Chauri Chaura 1922-92, the path breaking study done by Shahid Amin on Chauri Chaura incident in which rebellions peasants in Uttar Pradesh burned down a police station killing 22 policemen. The study by Amin is an attempt to unravel the complex interplay of an event which transforms into a memory and metaphor in the interstices of history. Unfortunately, no such study is made about the Wagon Tragedy and the fate of the 71 people, who suffocated to death in an air-tight wooden railway freight wagon. It is still mired as a footnote in the overall narrative of the Mappilla Rebellion. On the fateful day of November 19, 1921, 101 persons rounded up by the British military from various parts of south Malabar were put in to the freight wagon to transport them to Poddannur near Coimbatore. The arrests were made as part of the British efforts to suppress the rebellion of the Musilm peasants raging in the region. The Congress and khilafat coming together had ignited the simmering discontent amongst Muslim tenant peasants against the British rule which had imposed high land revenue on peasants. The rebellion which broke out in August 1921 following the British police raiding a mosque in Thirurangadi raged for nearly six months. By November most of the leaders were arrested and the British imposed martial law in the region. Thousands of people were arrested from the region and it was a common practice to transport them to the neighbouring Tamil Nadu in railway freight wagons as prisons in Malabar was overflowing with the arrested persons. But, mostly these were done in open wagons. However, on the fateful day 101 persons were dumped in to a closed wagon and send to Coimbatore. According to the narrative of a survivor, “we were perspiring profusely and we realized that air was insufficient and we could not breathe. We were so thirsty that some of us licked the perspiration from our clothes. I saw something like gauze over the door with very small holes so that no air could come in. Some of us tried to put it away but we were not strong enough”. To cut the long story short, when train reached Podannur the next day and the wagon was opened 64 persons were found dead, while seven others died on their way to hospital or in the hospital. The remaining 30 people were tried and sentenced to imprisonment ranging from seven years to 14 years. The British government glossed over the inhuman treatment of the issue and punished the wagon manufacturer, the transport officer and sergeant as culprits. The top officials of the British military administration in Malabar responsible for the heinous crime were left scot-free. The only solace was that the dependents of those killed were given a compensation of 300 rupees, perhaps a substantial amount when we take in to account the rate of inflation during the past 90 years. EMS Namboodiripad, Marxist ideologue and first chief minister of Kerala: “Nobody then had even thought of Wagon tragedy in Malabar as something politically significant at all-India level. The division created within the (khilafat) as a result of transformation of Malabar rebellion, that took off initially as tenant political movements, into ‘Mappila rebellion’ resulted in the failure among a large section of people to condemn and sense the depth of the cruelties by British authorities." M.Gangadharan: “When you consider months of torture, the horrific incident of Wagon tragedy of November 19-20 will seem trivial. “However now we will have to ferret out information through researches on the tortures held in places under ‘Martial law’." Prof. M.G.S. Narayanan, former chairman of Indian Council of Historical Research: “Only through great efforts could we understand the real meaning of incidents that take place around us. Even an incident that seems to be very simple might have many perspectives to it. In this sense, the local people due to their laziness were unable to comprehend even the Mappilah riots in recent times."